Crocheting with beads is a very old craft form. One of the most interesting historical uses of bead crochet was during World War I by Turkish prisoners in prisoner of war camps. 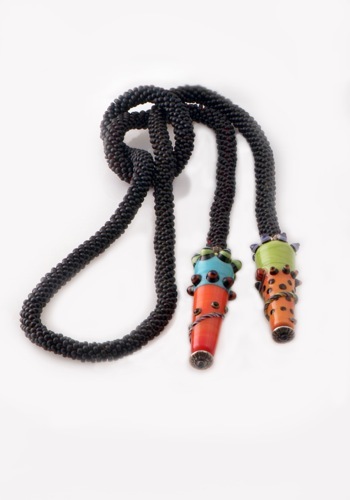 For something to do, many prisoners created intricately patterned bead crocheted ropes in the shape and colors of snakes. These crocheted snakes became valued gifts and were sought after as collectibles. Bead crochet can be done in many different ways, but each way involves pre-stringing the beads onto crochet thread before the crocheting begins. If beads are strung in particular order, the result will be a pattern of beads. While this sounds simple at first, it can get quite complex as the pattern gets more complex. And in many designs, the artist must envision how the pattern will look in 3D, and then turn the 3D design into a 2D flat patterned bead order for pre stringing. In the black necklace shown above, it was no trouble at all to pre-string hundreds of black beads on my crochet thread, because there was no pattern involved. 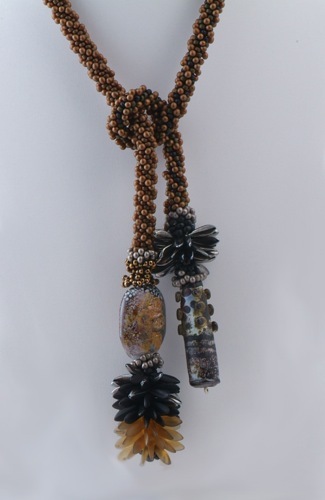 However, in the brown necklace below, notice how the bronze and black beads form a diagonal pattern. I had to plan out how to pre string the beads in this situation. And this example is very simple compared to some work by others. Check out the work of Judith Bertoglio-Griffin-- you’ll be amazed! Judith has several books, lots of patterns, and a great blog. Also, a book entitled, Bead Crochet Snakes, History and Technique by Adele Rogers Recklies will give you more information on the work done in the prisoner of war camps. I've got several bead crochet links on my bead crochet info page here.